This book focuses on fiction writers who want to make a career with their writing. In the digital era, which path is best for starting your writing career? Only you can know what your objectives are for your writing career (see For Heaven’s Sake, Get a Map and a Compass where I talk about Mission Statements and Five Year Plans). But here I’ll lay out the basic options and make the argument for Indie First… because I believe that’s the best starting option for the vast majority of writers who want their dreams to pay the bills. Vanity Press—publishers whose business model is predicated on getting money directly from authors, rather than through royalties off the author’s books (see Ch1.1 Authors Beware). Trad-Pub—Big Six (Five. Whatever.) Publisher. Ostensibly small presses are trad-pub as well, but it’s generally easier to get published by a small press, so I’m breaking them out. Small-Pub—Independent Press, not part of the Big Six, can vary from 100-year-old independent presses with established sales forces to one-person operations that just went into business. Generally smaller staff, but similar contracts to traditional publishing. In some cases, terms may be better for ebook royalties, but they usually offer small/no advances. Spec Writing—In the old-is-new department, some small presses ask writers to write on spec: the publisher supplies the story/characters/premise, the writer does the work. This is a new spin on the contract writing that authors have done for a long time. Digital Only—These imprints are either strictly digital or digital-plus-Print-On-Demand. They have small or no advance, sometimes pay higher royalties, and usually distribute on the same channels available to self-publishers (i.e. Amazon). Digital Only used to be the province of Small-Pub, but the Big Six now have digital-only imprints as well (Pocket Star with Simon and Schuster, Alibi, Flirt, and Hydra with Random House, and Impulse with Harper Teen). Some of these came under intense scrutiny by the SFWA (Science Fiction Writer’s Association) for poor contract terms. Indie—The author is the publisher, managing services like editing, formatting, and cover design by outsourcing or doing it themselves. Self-pub authors may or may not have an agent (perhaps to manage film and foreign rights). Some DIY self-pubbers contract with translators for revenue sharing in foreign markets, or partner with voice actors to produce audio versions of their books. There’s a whole marketplace of service providers to provide reasonably-priced services to help self-published authors manage their businesses. A self-pub author usually pays flat-rates for services but may sometimes partner and revenue share. Rights stay with the author. 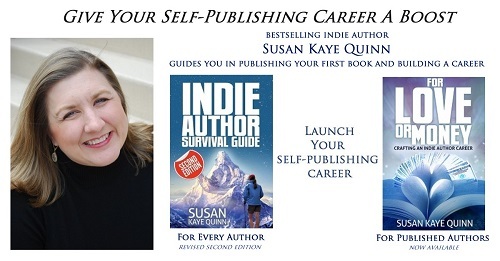 I’ll tell you up front that I think Indie First is the best option for most authors starting out—it gives you maximum control and is the path most likely to make you money. If you’re successful, publishers may query you (rather than the other way around), and you will then have the leverage to negotiate better contract terms. Let’s look at the other options first. My first book was small-press digital-only, but I went indie with my second book, largely because small-press companies have a hard time competing with self-publishing. The money isn’t as good (no advance and 35% royalties), plus authors lose control of covers and marketing. And small presses generally price higher than self-pub, maybe even as high as trad-pub, and higher prices make the books harder to sell. Unless the small press has a dedicated, exceptional sales team committed to marketing your book and getting you into bookstores (which some do, so check carefully), they are unlikely to be able to market any more effectively than the author can (and often less so). Especially if they are digital-only. However, if you are a first-timer and want someone to guide you through the debut process, small presses can do this. But I’ve seen more authors leave their small-press after the first book than I’ve seen stay with them (and be happy) for multiple titles. Spec writing might seem like a great way to get “in” with a publisher, but it’s also a way for publishers to own your work forever. In most cases, the publisher retains copyright, so be very careful with contracts like these. Make sure you get your money up front, and that you’re willing to basically be a hired-gun writer. Expect that you will not be in control of your stories. And check your Mission Statement to see if you want to spend your writing time on other people’s ideas. As the SFWA kerfluffle pointed out, contract terms are not good. Your ebook royalties are low (15%-20%). The advance is small ($1-2,000). One friend with a digital-only deal had a terrible experience: advance wasn’t paid on time; the publication date was moved without warning; there was no editing or marketing even though these were promised in the contract. I don’t know who gets deep, developmental editing anymore (hint: I do as an indie because I pay for it), but it’s least likely to be authors at the digital imprints. While it sounds great to be “published by a Big Six publisher” you have to remember: they are using their digital imprints as a way to see if your book takes off on its own, with little investment from them. Once again, you are spaghetti, maybe sticking to the wall, maybe not. If you sell big, they may do a print run for you. If you sell nothing, you now have a track record with that publisher of selling nothing. Obviously, I’m a fan of Indie First. Of course, some people will fare better going trad-pub. Someone has to be the star in the star system. And maybe having a book on a shelf at Barnes and Noble, even if it’s only for three months, is the only thing that will make you happy. To each his own on that. But for most people, earning a living with their written works is important, because it means they can spend more time doing what they love most: writing. The idea of indie publishing as a last resort has been the mantra for… well, pretty much ever, at least for serious fiction writers wanting a career in writing. In the past, this was based on the facts on the ground at the time: publishers had a lock on distribution, and indie publishing consisted mainly of doing a small print run and handselling books. Now, the facts on the ground have changed. Indie publishing connects authors to readers around the world at virtually no cost (in distribution). However, for many people, the mantra is still there: that indie publishing should be a last resort or no resort option. I espouse Indie First as a counter to the weight of history that said indie publishing was the death-knell of an author career. 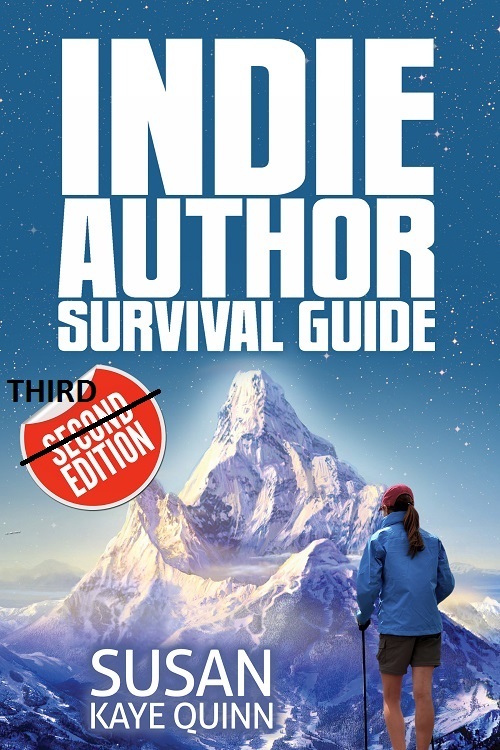 When the First Edition of the Indie Author Survival Guide came out, there was no hard data on the size of the indie publishing market, or what genres sold best, or pretty much anything. Amazon was a black box. 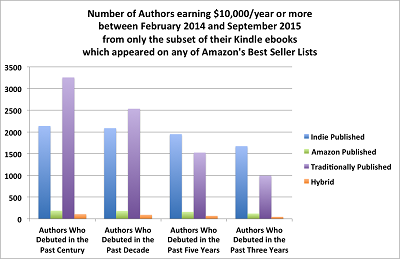 Fortunately for us, indie authors now have Author Earnings, which scrapes data from Amazon every quarter, showing trends like the fact that indie authors continue to take market share as trad publishers hike up ebook prices and lose sales. This data-rich website (Author Earnings) is one every indie author should dig through, but I’m going to give you the highlight reel, so you can understand the state of our industry. There were lots of early attempts at data collection on this new self-publishing phenomenon that were biased (in lots of ways). Smashwords (a distributor) regularly puts out surveys, but they only represent a small part of the market, mainly Apple (iBooks)— Smashwords doesn’t distribute to Amazon, which is 60% of the ebook market (and climbing), so their data captures only the broaded trends that are true on all platforms. Bowker (supplier of ISBNs) gives statistics on ebook sales that you should just disregard completely. Many self-published authors don’t purchase ISBNs for their ebooks (ISBNs are optional for publication on almost all retailers), so Bowker substantially undercounts the indie publishing world. Indie publishing is still a shadow industry in many ways, flying under the radar of most traditional ways to count sales (and income). By going straight to the biggest ebook retailer on the planet (Amazon) and scraping a snapshot of data (once per quarter), Author Earnings is doing an invaluable service for the indie author community by providing them with data directly from their primary marketplace. Amazon is notoriously tight fisted with its data, but with Author Earnings, you can get a snapshot of that marketplace through its publicly revealed data. This graph shows how indie published books have been steadily gaining market share at the expense of Big Five Publishing (traditionally published) books. The big drop in 2015 came when many publishers raised their ebook prices and subsequently saw their marketshare drop. Small Publishers continue to have about the same market share, but Amazon Published, meaning books that are published under one of Amazon’s traditional imprints like 47North or Skyscape, have steadily gained marketshare. 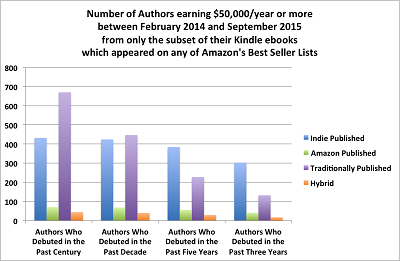 Basically, indie books and Amazon imprints dominate the ebook scene. You can see this on most bestseller lists, which are dominated by indie and Amazon imprints (with some exceptions). For the short amount of time indie publishing has been a viable option, this is astonishing. This data is staggering, especially when you consider that most indie authors have been in the business for less than three years. I’ve been publishing since late 2011, and I’m a veteran in this business. It’s a young business. And that traditionally published line? That includes mega bestsellers like Patterson… and marketshare is still dropping. 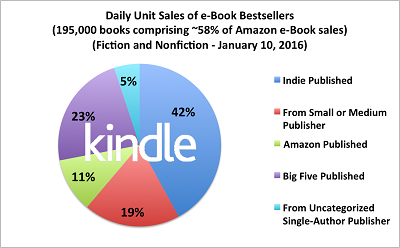 Upshot: the indie ebook market is LARGE… and growing. This is even more dramatic when you realize the indie ebook market is very young, and the tradpub numbers include mega bestselling authors with backlists that span decades. And since tradpub sales have been essentially flat the last several years, this means that indie books have essentially created their own market. Something to remember the next time someone says that self-publishing is destroying literature… when it’s actually getting more people to buy more books than ever before. But Don’t Most Indie Authors Make Very Little Money? It’s true that many authors (both indie and traditionally published) do not make a living from their works. Leaving aside whether that’s necessary or not (many people successfully keep day jobs and happily continue to write), this book is about turning your writing passion into a career that can pay the bills. So, are you better off going trad-pub or indie-pub, if your goal is to make a living at it? Definitely indie. You can see it in the graph—a small number of authors (relative to all the authors ever published traditionally) are taking the market by storm and eating it up. Even the indie authors who only make enough to pay the electric bill (but not the mortgage) are making more money than the vast majority of authors who pursue the traditional path. They’re on that path for years (and years and years), trying to get an agent and a book sold. Many publish short stories in hopes of getting literary “credentials” in order to sell their novel… only to end up years later with lots of short story credits, but no novels published. During that time, they could have been selling actual novels to actual readers who buy them with actual money. Author Earnings performed a longitudinal study of author income, putting authors in buckets of $10k, $25k, and $50k income per year. The results are amazing, even given that this substantially undercounts the actual number of authors because it only includes authors who are on bestseller lists. There are many authors who make a living across their (substantial) backlist without ever hitting a bestseller list. ALSO: these are just two of the categories Author Earnings looked at (I think of them as “food bill” money and “making a living” money. But you should read the entire report… there are substantial numbers of indie authors making hundreds of thousands of dollars a year from their books. NOTE: Genre matters a lot. Most writers have a sense that different genres sell at different rates. But the results from the Author Earnings report put this in bold relief. Romance sells, especially in ebooks. People who read indie books are voracious readers, and romance readers tend to be voracious, so ebooks and romance are a marriage arranged by Kindle. The other genres also sell well, but as the chart below shows, literary and children’s (middle grade) are just very tiny markets. If you’re putting out a middle grade book, you have to expect low sales. In fact, I don’t know many MG authors who make back their investment to publish their books (with few exceptions). Personally, my own middle grade book is my lowest seller. Upshot: romance is big, children’s is small. 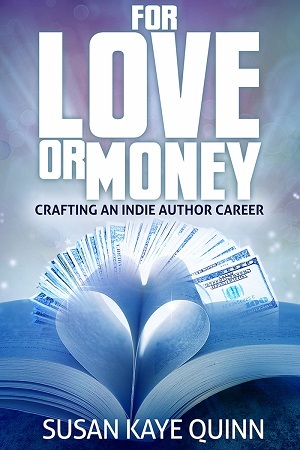 Bottom line: I see way more writers supporting themselves with their written works in indie publishing, and the Author Earnings report demonstrates why… there is money to be made in the indie market. In some cases, traditional publishing may still be the best choice for a book or an author. An author might chose that path for personal reasons. Or a particular genre (especially children’s books) may fare better in traditional publishing. I respect any author deciding to pursue publication by any means—it’s a brave, fine thing you are doing. But I’m an Indie First advocate. I see people living their dreams with indie publishing. My best advice: write a book, and if it’s publishable, put it out there. See if there’s a market. If not, write another book. A better book. Try a different genre. While you’re doing that, your indie books will be making more money for you than if they were sitting in the slush pile. And you will be learning incredibly valuable information about what makes the market tick, what readers like, and what you, as an author, truly want out of your career. How do you know if your work is publishable? More about that ahead in Seven Questions to Ask Before Self-Publishing. But first, For Heaven’s Sake, Get a Map and a Compass, where I’ll talk about knowing yourself as a writer before you take the leap into publishing.